The Barnard Archives and Special Collections serves as the final repository for the historical records of Barnard College, from its founding in 1889 to the present day. For more information, please contact archives@barnard.edu. The Archives and Special Collections at the Augustus C. Long Health Sciences Library of Columbia University can help you find information about the schools of the Medical Center: College of Physicians & Surgeons, School of Nursing, College of Dental Medicine (formerly the School of Dental & Oral Surgery), Mailman School of Public Health, and the College of Pharmaceutical Sciences. For more information, please contact hslarchives@columbia.edu. Bhimrao Ramji Ambedkar is considered the father of the Indian Constitution and a champion of rights for India's "untouchables." Born an "untouchable," Ambedkar overcame prejudice to obtain an education, eventually earning advanced degrees from Columbia and the London School of Economics. Scanned photographs and pages from "Homage to Dr. Ambedkar, Centenary Celebration, Columbia University 14th April 1991" from the Historical Photograph Collection. Article from Alumni News December 19, 1930. Archival collections are non-circulating and can only be viewed in the Rare Book & Manuscript Library's reading room (RBML). In order to use the University Archives collections at the RBML, researchers are required to register their own Special Collections Research Account before their visit and to validate the account in person with government-issued photo identification or Columbia ID card. Compiled by the Columbiana curators and University Archives staff, this collection contains information on alumni, faculty, officers and other notable Columbians. You can request materials directly from HBF finding aid: click the check box located on the right for Ambedkar (Box 7, folder 16), and then scroll back to the top of the container list document and click “Submit Request” button in the red-rimmed box at top.This should lead you directly to your Special Collections Research Account to complete the request form. This collection is stored onsite and can be made available on the same day. Materials will be paged when you sign into the Reading Room. HPC is our largest collection of images and includes portraits of individuals (ca. 34,000 items), images of buildings and grounds (ca. 12,000 items), various university events, student activities and student life, athletics, academics, university symbols, university administration, and campus activity during WWI and WWII. While there are some scanned photographs and pages from "Homage to Dr. Ambedkar, Centenary Celebration, Columbia University 14th April 1991," you can request to see the materials in person directly from HPC finding aid: click the check box located on the right for the box(es) you need (for Ambedkar, Box 2), and then scroll back to the top of the container list document and click “Submit Request” button in the red-rimmed box at top. This should lead you directly to your Special Collections Research Account to complete the request form. This collection is stored onsite and can be made available on the same day. Materials will be paged when you sign into the Reading Room. A collection of index cards kept by the Alumni Federation, these records contain degree and year for alumni as well as information about their lives after Columbia: occupation, addresses, milestones, etc. You can request materials directly from Alumni Federation Cards finding aid: click the check box located on the right for the box(es) you need (for Ambedkar, Box 1), and then scroll back to the top of the container list document and click “Submit Request” button in the red-rimmed box at top. This should lead you directly to your Special Collections Research Account to complete the request form. This collection is stored onsite and can be made available on the same day. Materials will be paged when you sign into the Reading Room. Using the Courses Taken list available online (not a University Archives resource), you can find the corresponding course descriptions, including faculty listings, by searching the related Bulletins of Information or Announcement for the different schools/divisions. For information on how to access the Bulletins, see the Course Descriptions research guide. You can request to see Ambedkar's Master's essay (Administration and finance of the East India company) and/or his dissertation (The evolution of provincial finance in British India; a study in the provincial decentralization of imperial finance) in the Rare Book and Manuscript Library (RBML) reading room. From the catalog record, select "Request: Special Collections" on the right side of the page. You will then be able to add the request to your Special Collections Researcher Account. Please note that these volumes are stored offsite. We prefer 5 business days advanced notice to retrieve materials from offsite storage, but require at least 48 business hours to process such requests. If you wish to purchase a PDF copy of a Master's essay or PhD dissertation serviced by the University Archives up to 650 pages in length, there is a $30.00 flat rate. To place an order, please complete, sign and return the photocopy order form. Payment can be made by calling us with MasterCard or Visa credit card details or by sending a check drawn on a U.S. Bank made payable to "Columbia University". After attending Harvard Law School, Ginsburg transferred to Columbia Law School and graduated first in her class in 1959. In 1972, she became the first woman full professor at Columbia Law School. Ginsburg held that post until her appointment to the U.S. Court of Appeals and in 1993, Ginsburg became the second woman to serve on the Supreme Court. Ginsburg correspondence from Central Files from 1971-1972 to 1982-1983 and again, related to her Supreme Court appointment, 1992-1993. Compiled by the Columbiana curators and University Archives staff, this collection contains information on alumni, faculty, officers and other notable Columbians. You can request materials directly from HBF finding aid: click the check box located on the right for the Ginsburg (Box 113, folder 7), and then scroll back to the top of the container list document and click “Submit Request” button in the red-rimmed box at top.This should lead you directly to your Special Collections Research Account to complete the request form. This collection is stored onsite and can be made available on the same day. Materials will be paged when you sign into the Reading Room. HPC is our largest collection of images and includes portraits of individuals (ca. 34,000 items), images of buildings and grounds (ca. 12,000 items), various university events, student activities and student life, athletics, academics, university symbols, university administration, and campus activity during WWI and WWII. While there are some scanned photographs available, you can request to see the materials in person directly from HPC finding aid: click the check box located on the right for the box(es) you need (for Ginsburg, Box 46), and then scroll back to the top of the container list document and click “Submit Request” button in the red-rimmed box at top. This should lead you directly to your Special Collections Research Account to complete the request form. This collection is stored onsite and can be made available on the same day. Materials will be paged when you sign into the Reading Room. This collection includes a series with photographs and negatives of people who were written about in the pages of student newspaper, the Spectator. You can request materials directly from the Columbia Spectator Photograph collection finding aid: click the check box located on the right for the box you need (Ginsburg in Box 8, folder 75), and then scroll back to the top of the container list document and click “Submit Request” button in the red-rimmed box at top. This should lead you directly to your Special Collections Research Account to complete the request form. This collection contains prints and negatives covering the 20th century and recent image files from the early 21st century in print, negative, and digital formats. 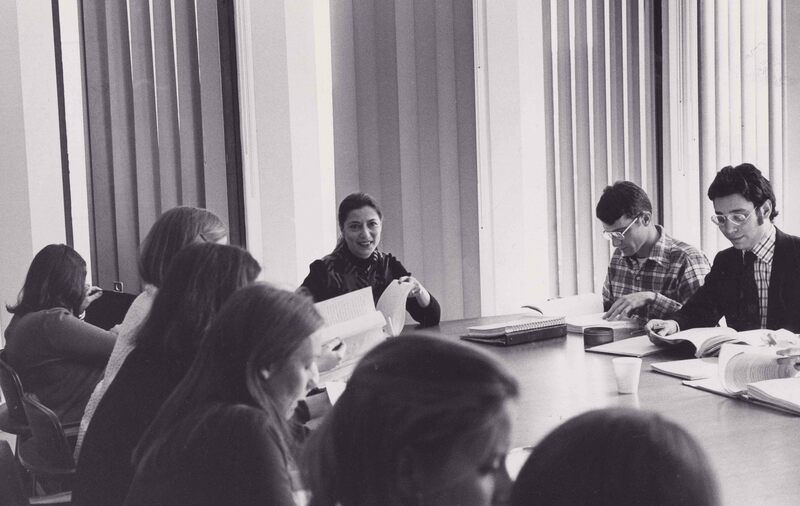 The negatives in this collection are often the best source for finding images of more recent events, including Ginsburg at the Law School in 1972 (Box 56), at the Alexander Hamilton Dinner in 1993 honoring Michael Sovern (Box 72), at a 1993 Low Rotunda panel (Box 93) and at a 1998 moot court event (Box 93). There are also two sleeves of July 1993 portraits of Ginsburg (Box 91) found in this collection. You can request materials directly from OPA Finding Aid: click the check box located on the right for the box(es) you need, and then scroll back to the top of the container list document and click “Submit Request” button in the red-rimmed box at top. This should lead you directly to your Special Collections Research Account to complete the request form. These records include documentation on the administration, development, and history of departments, programs, research institutes and centers, schools, and academic services, from 1939 to 2006. You can request materials directly from the Office of the Provost finding aid: click the check box located on the right for the box you need (Ginsburg, Ruth Bader, 1979-1980, Box 377, folder 23), and then scroll back to the top of the container list document and click “Submit Request” button in the red-rimmed box at top. This should lead you directly to your Special Collections Research Account to complete the request form. The Law Library's Special Collections contains materials such as class lists, student newspapers, photographs, and yearbooks from select years. The Library also holds materials which document many aspects of the Law School's history including student notebooks, faculty directories, building plans, course catalogs, reunion materials, and Law School publications. For more information, please contact the Special Collections Librarian at heath.mayhew@law.columbia.edu. At Columbia, Koo earned his BA in liberal arts in 1908, distinguishing himself as a brilliant student who participated in a remarkable number of extracurricular activities. He served as editor-in-chief of the Columbia Spectator, was a member of the Philolexian Society, a number of debate teams, the track team and Delta Epsilon Rho. In 1912 he received his PhD in international law and diplomacy. A Nationalist Chinese diplomat with a long career in diplomatic service, he served as Prime Minister, was a signer of the United Nations Charter and also served as a member of the International Court of Justice in The Hague. Koo's Master's Essay: History and Law of the Case of the "Caldera"
Compiled by the Columbiana curators and University Archives staff, this collection contains information on alumni, faculty, officers and other notable Columbians. You can request materials directly from HBF finding aid: click the check box located on the right for Koo (Box 168, folder 1) and then scroll back to the top of the container list document and click “Submit Request” button in the red-rimmed box at top.This should lead you directly to your Special Collections Research Account to complete the request form. This collection is stored onsite and can be made available on the same day. Materials will be paged when you sign into the Reading Room. This is the core administrative collection of records, from the 1890s to the present. Central Files chiefly contains correspondence (sent and received) between Columbia University administrators and other University officers, faculty, trustees, and individuals and organizations from outside the University. There are two sets of correspondence with Koo: (1) related to his honorary degree in 1917 (Box 153, folder 13); and (2) regarding the donation of his paper and the completion of his oral history from 1975-1976 (Box 776, folder 8). You can request materials directly from the Central Files Finding Aid: click the check box located on the right for the box(es) you need, and then scroll back to the top of the container list document and click “Submit Request” button in the red-rimmed box at top. This should lead you directly to your Special Collections Research Account to complete the request form. HPC is our largest collection of images and includes portraits of individuals (ca. 34,000 items), images of buildings and grounds (ca. 12,000 items), various university events, student activities and student life, athletics, academics, university symbols, university administration, and campus activity during WWI and WWII. While there are some scanned photographs available, you can request to see the materials in person directly from HPC finding aid: click the check box located on the right for the box(es) you need (for Koo, Box 69), and then scroll back to the top of the container list document and click “Submit Request” button in the red-rimmed box at top. This should lead you directly to your Special Collections Research Account to complete the request form. This collection is stored onsite and can be made available on the same day. Materials will be paged when you sign into the Reading Room. 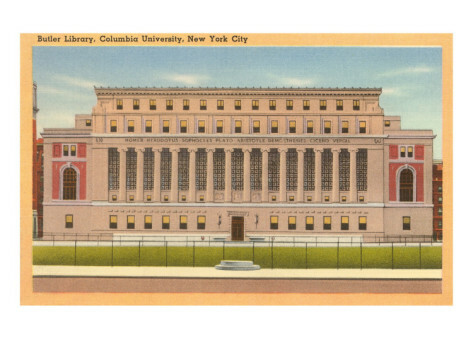 A collection of index cards kept by the Alumni Federation, these records contain degree and year for alumni as well as information about their lives after Columbia: occupation, addresses, milestones, etc. You can request materials directly from Alumni Federation Cards finding aid: click the check box located on the right for the box(es) you need (for Koo, Box 64), and then scroll back to the top of the container list document and click “Submit Request” button in the red-rimmed box at top. This should lead you directly to your Special Collections Research Account to complete the request form. This collection is stored onsite and can be made available on the same day. Materials will be paged when you sign into the Reading Room. While some undergraduate and graduate course descriptions have been scanned, you can find all of the relevant course descriptions, including faculty listings, by searching the related Bulletins of Information or Announcements for the different schools/divisions. For information on how to access the Bulletins, see the Course Descriptions research guide. Koo's Master's Essay is available online as a PDF document. You can also view the Master's Essay (History and law of the case of Caldera) and/or request to see Koo's dissertation (The status of aliens in China) in the Rare Book and Manuscript Library (RBML) reading room. From the catalog record, select "Request: Special Collections" on the right side of the page. You will then be able to add the request to your Special Collections Researcher Account. Please note that these volumes are stored offsite. We prefer 5 business days advanced notice to retrieve materials from offsite storage, but require at least 48 business hours to process such requests. If you wish to purchase a PDF copy of Koo's dissertation which is serviced by the University Archives, there is a $30.00 flat rate for up to 650 pages. To place an order, please complete, sign and return the photocopy order form. Payment can be made by calling us with MasterCard or Visa credit card details or by sending a check drawn on a U.S. Bank made payable to "Columbia University". Koo's yearbook is available online. In addition to the yearbook, the University Archives has a senior class book (Class of 1909, call number CTR F09). The senior class books often contain more detailed information about graduates than what is noted in the corresponding yearbook. There is also a 30th reunion book in our holdings (Class of 1909 30th Reunion, call number CTR F093). To request either of these class books, you will need to enter the request manually in your Special Collections Research Account. In your account under New Request, look for the Manual Request Form (at the bottom of the page), and complete the form by entering the title and call number you are interested in. There are two collections held at the Rare Book & Manuscript Library (RBML) related to Koo. The first is the extensive Wellington Koo papers, 1906-1976. You can also find some Koo related correspondence in The Edwin Robert Anderson Seligman Papers, [ca. 1750]-1939 both in the cataloged correspondence series (Box C18) and un-cataloged correspondence dating from 2 October 1914, 2 November 1914 and 24 March 1916 (Box 5 and 5A). Since the Koo papers finding aid is currently a PDF document, you will need to first identify boxes via the PDF finding aid document and then go back to the bibliographic record and click on the link that says "View CLIO Record and Request from Special Collections". Once you are on the CLIO page, look for the "Request from Special Collections" link at the bottom of the shaded box all the way to the right side of the page. You will be brought to a page showing box numbers with little radio buttons to click. Click on the box you need and then click on the "submit" button at the bottom of the page. At that point you will be prompted to log into your account to schedule the retrieval date and once you do that you should see the requests listed in your account. You will have to go through this process for each box you wish to use. You can request materials directly from the Seligman Finding Aid: click the check box located on the right for the box(es) you need, and then scroll back to the top of the container list document and click “Submit Request” button in the red-rimmed box at top. This should lead you directly to your Special Collections Research Account to complete the request form. The Columbia Center for Oral History (CCOH) has the transcripts of an extensive oral history project with Koo. The interview covers his childhood and education, 1882-1912; first decade as diplomat, 1912-22; sevice in China, 1922-32; mission to Paris, 1932-41; second mission to London, 1941-46; to Washington, 1946-53; second mission to Washington, 1953-56; service as foreign minister and premier; representative to League of Nations and United Nations; associate justice of the International Court of Justice at The Hague, 1956-67. To request oral history transcripts, you will need to register a Special Collections Research Account. From the CLIO online library catalog record: click on "Request: Special Collections" on the right side of the page. This should lead you directly to your Special Collections Research Account to complete the request form. This collection is stored onsite and can be made available on the same day. Materials will be paged when you sign into the Reading Room. 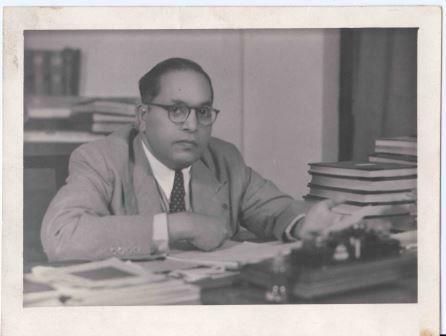 History and Law of the Case of the "Caldera"
Left - Bhimrao Ambedkar sitting at a desk (Scan 0716) Historical Photograph Collection (Box 2). University Archives, Rare Book and Manuscript Library, Columbia University Libraries. Center - Ruth Bader Ginsburg leading a seminar discussion at the School of Law, ca. 1975 (Scan 4330) Historical Photograph Collection (Box 46). University Archives, Rare Book and Manuscript Library, Columbia University Libraries. Right - V.K. 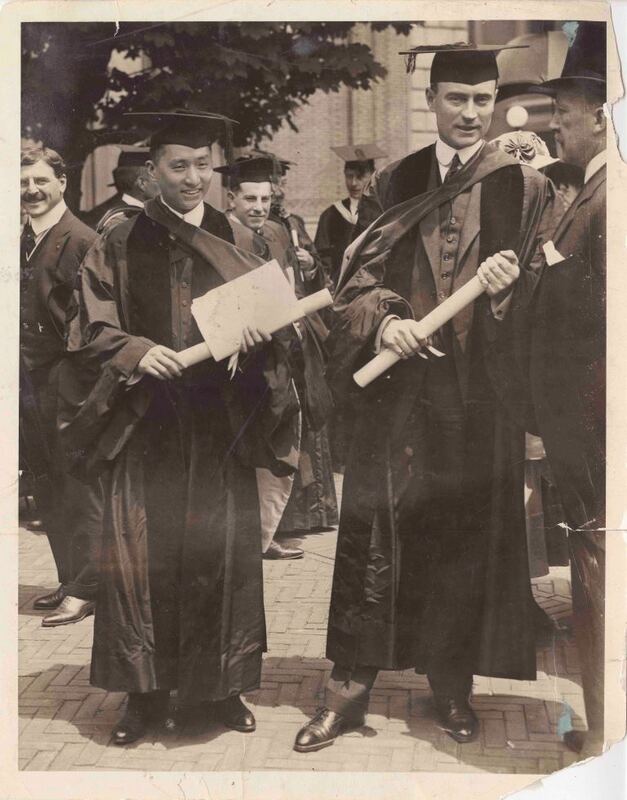 Wellington Koo and Mayor John Puroy Mitchel at 1917 Commencement in academic regalia (Scan 4049) Historical Photograph Collection (Box 69). University Archives, Rare Book and Manuscript Library, Columbia University Libraries.